During the past decades, Plainsboro—once a rural, agricultural community—has experienced considerable growth pressure. Between 1980 and 2006, the township’s population grew from around 5,600 to 21,000. Rather than allowing sprawling suburban growth patterns to continue, the township has preserved nearly 50 percent of its farmland and open space while concentrating some of its development in certain areas. To that end, in the late 1990s, Plainsboro started to plan the transformation of the township’s central area from a crossroads into a local destination. Working with Sharbell Development Corporation, the township fashioned a plan for a Village Center and crafted new zoning regulations and design standards to implement it. The Village Center represents an alternative to the auto-dependent, single-use development common to many suburban communities. It offers residents an attractive and vibrant mixed-use environment with green spaces and public amenities in the township’s center. It is walkable and accessible through a variety of transportation alternatives, including a bus that connects to the Princeton Junction train station. 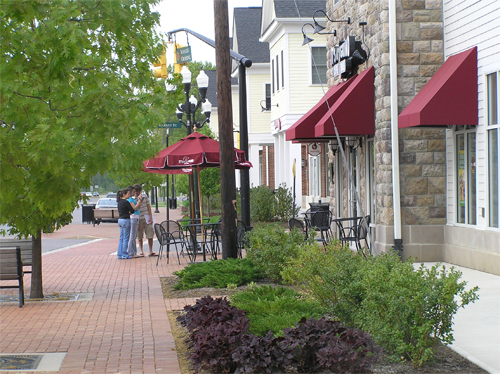 To ensure high-quality public spaces, the Village Center plan has provisions for design elements, including landscaping, seating, lighting, bike racks as well as pedestrian and bike path connections to Plainsboro’s town-wide pedestrian and bicycle pathway system. The planning strategy for the township’s central portion focused on three undeveloped sites, two of which are occupied by village-type housing and the third by a mixed-use development known as the “Village Center” (the recipient of this year’s Smart Growth Award). The 17-acre Village Center, originally zoned for approximately 14 large-lot single-family homes, was divided into a grid for residential and non-residential uses and also contains Market Square, a half-acre village green area at the center of the project, along with various parking areas. Presently, the Village Center is approved for 110,000 square feet of commercial, retail and office space, in addition to a new 34,000-square-foot township library. The Village Center also contains 11 single-family homes and 12 townhouse dwellings as well as eight rental apartments, which will be located on the upper floors of a planned mixed-use building on Market Square. The two residential sites located outside the Village Center contain 224 primarily age-restricted units of various housing types. Plainsboro has obtained Plan Endorsement from the State Planning Commission, which ensures that local plans are consistent with the State Development and Redevelopment Plan and entitles municipalities to a higher priority for available funding, streamlined permit reviews and coordinated state agency services. A series of public information meetings gave the community opportunities to raise concerns—such as noise and traffic—which the township addressed through downzoning two of the planning area’s three sites from commercial to residential uses and shifting some of the commercial development to the new mixed-use Village Center. The township has also approached the Center’s implementation in incremental steps, which helped the public realize that the development would enrich, rather than overwhelm, their community. Today, with the majority of Village Center buildings completed and occupied (full build-out is expected around 2010), the project enjoys broad community support. While township residents have patronized its shops and restaurants, the proximity of the employees of the nearby Princeton Forrestal Center, the new township library scheduled to open next spring and the new hospital planned a short distance away promise to bring vibrancy and success to the Village Center.